I've been asked to try to make a trance mix, just like you afterhours DJ's makes them. I was just wondering, what you use? Programs, equipment and etc. I was thinking about making the mix in Virtual DJ or something like that. Now I know, that doing that isn't so popular amongst you pro's, but I guess it's possible to do it that way, right? Hercules DJ Console Mk2 (MkII), a revolutionary complete portable DJ controller, Mixer and USB audio interface for desktop/laptop PCs with no match in the worldwide market. M-AUDIO - X-Session Pro - USB MIDI DJ Mixer Controller all you needis one usb cable and laptop, but i used my cousins i dont have one just desktop. but when i get my financial aid money from college if im lucky i might feast myself on this a prety good price for my poornes. Last edited by Junior; Sep 4th, 2009 at 05:12. If you don't have the hardware, you can always mix on software such as 'Audacity' no problem as long as it sounds good. 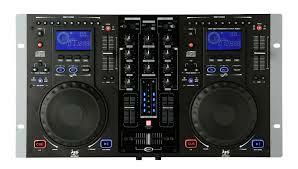 I've got the Gemini CDJ-3600 in Junior's post, and I have to say I have mixed feelings about the unit. Really can't complain about the price, but with the price comes some sacrifices. My biggest complaint is the pitch control, the very first step from 0 is +/- 0.7%. After that you can get 0.1% increments but not easily. Sometimes the pitch skips between two adjacent values (for example 0.7 and 0.8), almost like if you hold a light switch halfway on the light flickers on and off. The cue and play/pause buttons are soft button, and I find them to be a bit unresponsive. If you tap the cue button any faster than about 1 press per second it doesn't respond to some of them. Basically you can't do what you can do with the cue button on Pioneer CDJ's for example. These complaints aside, it's still unbelieveably good value for what you get and will definitely be good if you just want something cheap to start off. As you said, "but with the price comes some sacrifices." Last edited by Raffi; Oct 14th, 2009 at 18:14. I didn't read through all of the replies, but you can download the Beatport player for free. While it does a good job generating play list and can automatic beat match, there is no record function available. I'm sure there is some way around this software wise, if not, hooking up an external CD recorder might work for recording. Is there any possibility to mix in Winamp? If yes, please let me know how. I tried to mix in winamp but it's not possilbe, the program doesn't support bpm features or syncing. Try with AIMP player... it could work. Are you sure? :-) As I know it is possible to make mixes in Winamp. Just one small information, what is the "toggle crossfading between tracks" button in Winamp?? ?